“Combining NVIDIA Quadro RTX GPUs with pre-installed data science software, NVIDIA-powered Data Science Workstations offer data scientists a fully integrated, high-performance, enterprise-class solution that has the power and memory to handle massive amounts of data, while bringing GPU-accelerated software to machine learning workflows,” Sandeep Gupte, Director, Professional Visualization, NVIDIA. As companies capture more data, powerful computing platforms with the speed and capacity to convert massive amounts of information into insights are needed so they can offer enhanced products and services for their customers. Powered by Quadro RTX GPUs, providing up to a colossal 96 GB of GPU memory to handle the largest data sets, and pre-installed with industry leading data science software, NVIDIA-powered Data Science Workstations offer a readily deployable solution for data scientists that transforms machine learning development by allowing data scientists to focus on working, not systems administration and troubleshooting. Built by leading workstation partners, including several working with PNY, to ensure maximum compatibility and reliability, combined with optional support services for NVIDIA developed software, NVIDIA-powered Data Science Workstations deliver a fully integrated solution to boost productivity, reduce time to insight, and lower the cost of data science projects. Content production is undergoing a massive surge as rendering complexity, quality, and customer or viewer expectations continue to increase. Designers and artists across industries strive to produce more visually rich content faster than ever, but they’re bound by inefficient CPU-based solutions. NVIDIA RTX Server defines a new standard for on-demand bare metal or virtualized rendering in the design suite or datacenter, enabling easy configuration of on-demand render nodes for batch and interactive rendering. It combines Quadro RTX 8000 and 6000 GPUs equipped with NVLink with powerful RTX technology enabled ISV rendering solutions to deliver a powerful and flexible architecture to meet the demands of creative professionals. 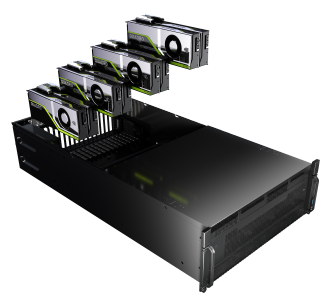 With industry-leading content creation and render software pre-installed, and rigorous NVQual testing for 24/7 uptime, NVIDIA RTX Server provides a powerful and easy-to-deploy rendering solution that can scale from group or departmental installations to the largest data centers, at a fraction of the cost of CPU-only render farms. If you are at GTC, make sure you visit the PNY booth #1133 to see how the power of NVIDIA Quadro RTX GPUs are revolutionizing the industry, and enter for your chance to win an NVIDIA Quadro RTX 4000! 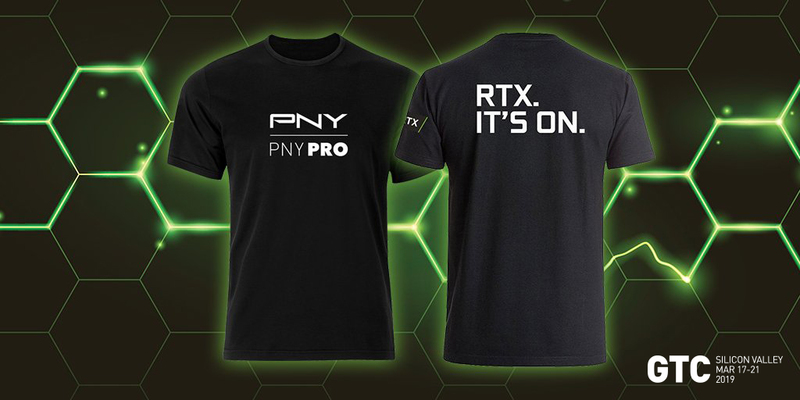 Don’t forget to ask for your limited edition RTX T-shirt while supplies last!